Rebuilding New Jersey' Shore, One Boardwalk At A Time When Hurricane Sandy swept through New Jersey last year, it destroyed homes and businesses. It also obliterated boardwalks — the center of social and economic life in the towns. In the months since, towns have rushed to rebuild their boardwalks, but not everyone thinks the money is well spent. People walk on the boardwalk in Seaside Heights, N.J., on Friday. 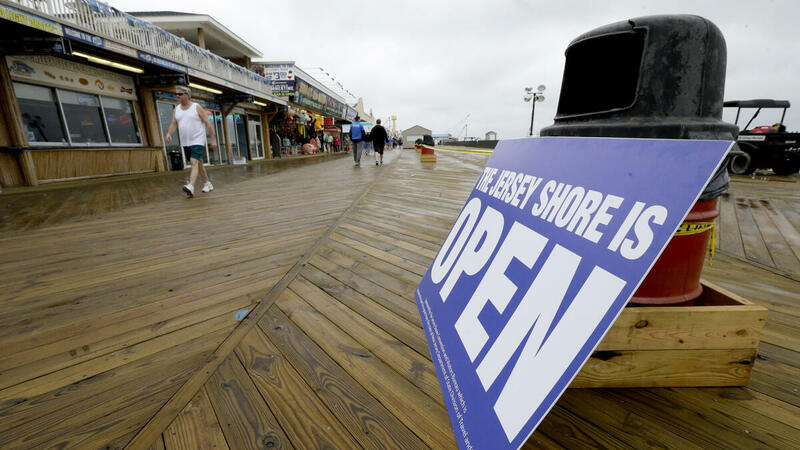 The Jersey Shore beaches officially opened for the summer, after rebuilding following the destruction left behind by Superstorm Sandy last fall. The storm caused $37 billion of damage in the state. When Hurricane Sandy swept through New Jersey last year, it destroyed many homes and businesses. It also obliterated the boardwalks that are the center of social and economic life in the towns. In the months since, many of these towns have rushed to rebuild their boardwalks, but not everyone thinks the money has been well spent. The boardwalk in Belmar, N.J., was among those destroyed and scattered all over town. But just seven months later, the town has managed to rebuild all 1.3 miles of it. It's now made of synthetic wood on pilings dug deep into the sand — at a cost of more than $8 million. "We promised that a new boardwalk would be built in time for Memorial Day, and today I can proudly say we have delivered," Mayor Matt Doherty said at a ceremony to mark the effort this week. The federal government will pay for much of the boardwalk, but to kick-start the project the town held what it called an adopt-a-board campaign. It raised nearly $700,000 from private donors to offset the town's costs. "Boardwalks are opening all over New Jersey, and I'm going to try and be at every one of them," said New Jersey Gov. Chris Christie, who's been going from one ribbon-cutting to another all week. The rush to rebuild boardwalks is testament to the role they play in towns like Belmar. In many places, boardwalks are lined with seasonal businesses, restaurants, T-shirt shops and bike-rental stores. Tom Arnone, a Monmouth County, N.J., official, says boardwalks bring in huge amounts of money to the towns, and also pay a lot of taxes. "[There's also] all the businesses that rely on it and then all the jobs that we're putting people back to work," Arnone says. "That's why it was so important for all of us to work together and be in a partnership to make this happen." But boardwalks also play a certain emotional role in the life of New Jersey towns. Belmar has had a boardwalk since 1875. It's a place to hang out, meet friends or just stroll and contemplate the ocean. Every day Phil Sanfilippo, who's retired from the Defense Department, walks the boardwalk for five miles from Seagirt to Belmar and back. "It gave us an empty feeling when we came down here and all this was gone," Sanfilippo says. "Now you may say, 'Well, that's stupid,' when people lost their homes. However you take away a person's identity and you take away their being, and to us down here, the boardwalks are what it's all about." But a lot of people did lose their homes in Belmar, and some of them aren't so happy about the new boardwalk. Gail Hershey, who runs a beach shop in town, has been here for 19 years. She says she understands why towns like Belmar made their boardwalks a priority because of the money, but sees how those who lost homes might feel pushed aside. "I'm still out of my house and that's unfortunate, and I know a lot of my friends are still out of their homes," Hershey says. "A lot of them feel the towns put all their money into the boardwalks and didn't help as much with the homes and the people." New Jersey officials acknowledge that many homeowners are still hurting and considerable work remains to be done to repair the damage Sandy left behind. But they also say beach towns like Belmar make a lot of their tax revenue along their boardwalks, and if they can't do that, the task of rebuilding will become much harder.